Contemporary technological wizardry has done for a great film what previous print media books had attempted to do for such classics as Lawrence of Arabia, The Godfather, and Jaws. And that is to retell the detailed story of the "making" of a great film in all its detail. 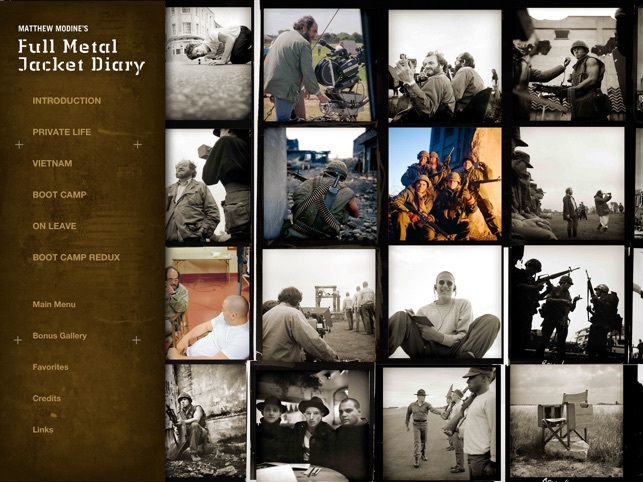 Matthew Modine's nuanced vocal narration of his own personal diary, along with a vast collection of his photographs taken during production, provide movie fans with the fullness of the movie-making experience. 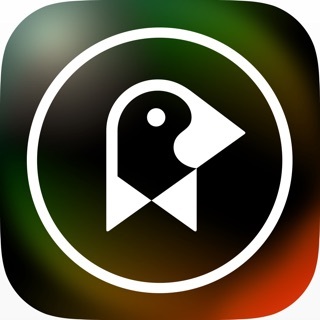 Accompanying sound effects and loads of peripheral information and external links give the app user the full picture...and everything available at your fingertips. In addition to what producer Adam Rackoff has created for this film is the promise of what this technology will be able to do for other great films as his methods are applied on into the future. It is a feast for the movie fan and a harbinger of what is yet to come. Not Just for Movie Fans! 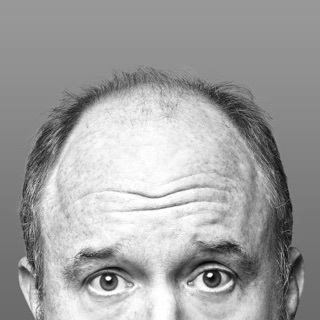 When first learning of the making of this APP, I thought it would really be for a niche audience of either Stanley Kubrick, the movie itself, or Matthew Modine, or all three. 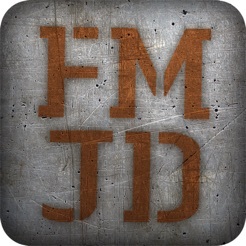 I am so pleased with this app, for it has more universal appeal. First, it is a well written and entertaining diary about the life of a family living in another country while making this great movie. 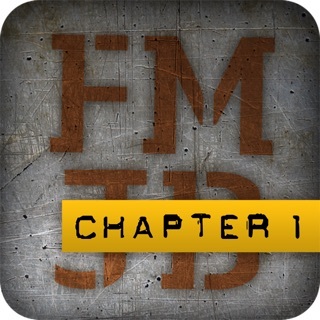 Second, this app provides insight into the movie making process even for the casual movie viewer. As a frequent APP user, I found this one to be multi-dimensional with many layers of information and stunning visual design. It's truly a new way to experience an APP. The next level of richness in APP design. Incredible App - Thank you, Matthew, Adam and team! 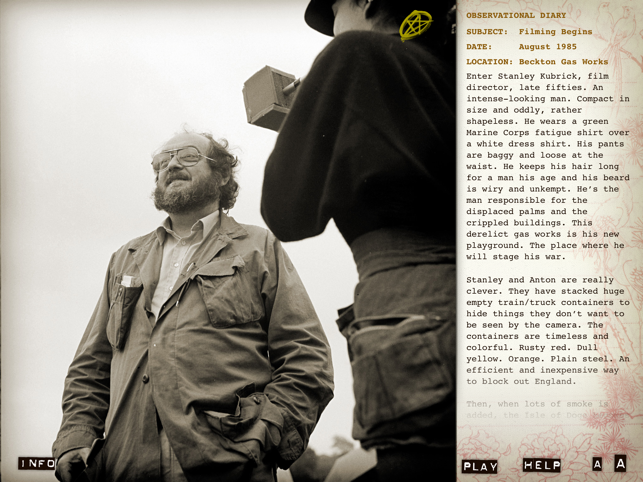 This is an amazing interactive app for the iPad and something Kubrick would indeed really love. 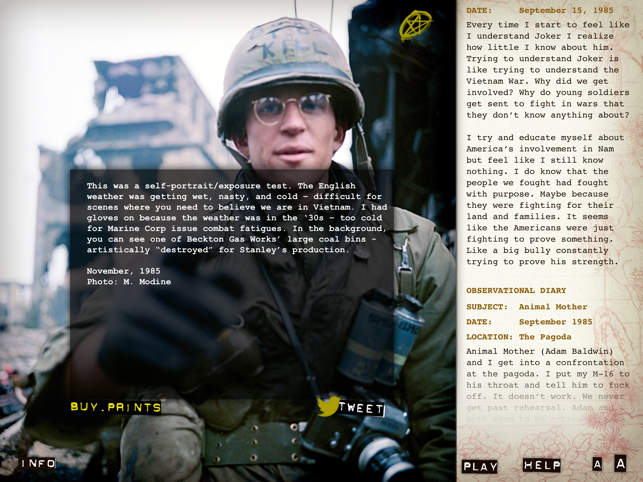 Great use of audio and visual to recount the production of one of the greatest war movies of all time. If you have an AppleTV, this one works incredibly well, too, with the mirroring function. It's basically one of the best, personal documentaries about the making of a classic film. 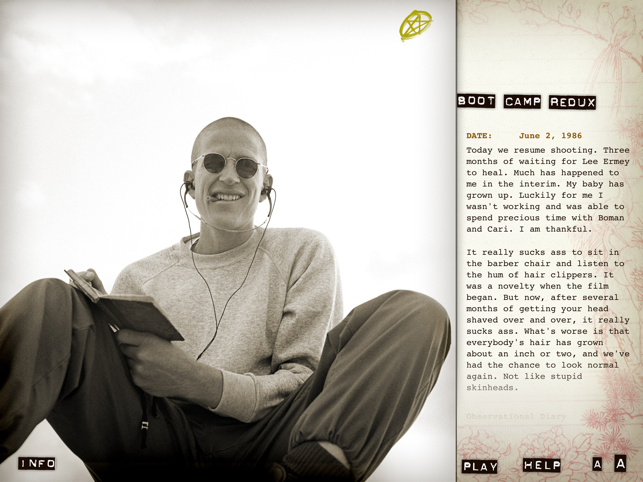 Seen on an HD TV and using your iPad as a remote, this app provides hours and hours of insight on Full Metal Jacket with the best narrator possible. 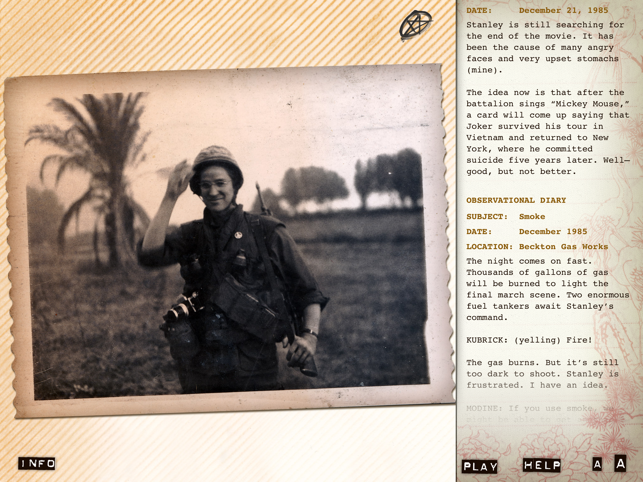 Highly recommended for cinema buffs, fans of Matthew Modine, Stanley Kubrick, Full Metal Jacket and anyone who's ready for a great interactive multimedia experience.